38 The PCB Magazine • August 2017 I recently had the great pleasure to be work- ing with BATM Systems at their new factory in Romania. The process concept is the brain- child of Steve Driver. For those who don't know Steve, he is a gentleman of many years of expe- rience in the UK printed circuit industry. Even after several decades of circuit production, he has an energy and enthusiasm for manufactur- ing which are most infectious! As I walked into the BATM wet process area I had to question why the developer was miss- ing from the set-up. The answer was straight- forward enough: Because the etch resist is ap- plied directly by "drop on demand" technology so there is no need for any dry film developer (or photoplotter, dry film laminator or UV ex- posure). The clever printing technology has been supplied by a company called Mutracx, based in Holland. The machine they delivered to Roma- nia is the Lunaris, and it can print a panel in not much more than 20 seconds, so it aligns very well to European etching and stripping speeds. It is a machine designed for fitment within the conveyorised image-etch-strip process and can be integrated into the middle of the manufac- turing line very easily. The Lunaris is capable of being used for both innerlayer (print and etch) or for outer layer (pattern plate) using the same ink for both process routes. It strips in normal dry film stripping solution, although the tem- perature may need to be a little higher. 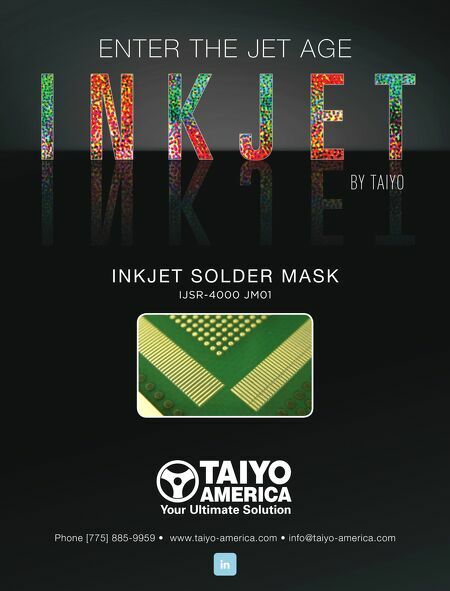 The high print speed, as compared to other drop on demand printers, is possible because of the multi-head print array spanning the com- plete width of the conveyor which allows each side of the panel to be imaged in a single move- ment through the print hardware. 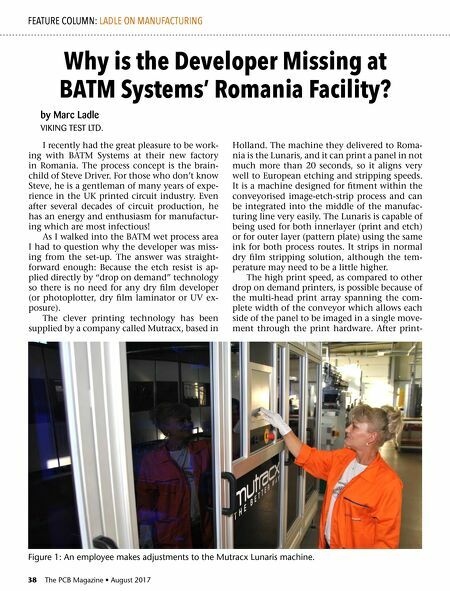 After print- Why is the Developer Missing at BATM Systems' Romania Facility? FEATURE COLUMN: LADLE ON MANUFACTURING by Marc Ladle VIKING TEST LTD. Figure 1: An employee makes adjustments to the Mutracx Lunaris machine.